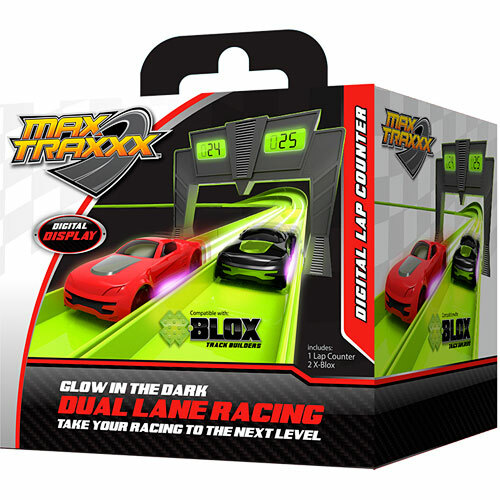 Totally exciting Light Trace Technology elevates this racing experience! Max Traxx Digital Lap Counter/Starting Gate evens the playing field and ensures fair competition to the finish line. Starting gate counts down from 5 to ensure a fair race; don't start too soon or you'll trigger a false start. Lap counter counts each lap up to 999 circuits around the track. Max Traxx Racing accessories provide exciting choices that let you shape the course of your dreams. Each sold separately. Accessory for Max Traxx Tracer Racer RC Twin Loop Set, sold separately. Batteries included. Measures approximately: 4.75 x 4.00 x 3.75 inches..